In 4 months, the grant that funds the consulting on curriculum and professional development I do with New Visions for Public Schools ends and unfortunately, it does not look like a new grant is on the horizon. Consequently, with blessings and support from my colleagues at New Visions, I am looking for either another consulting contract or full-time employment. Other smaller tasks related to supporting 80 or so secondary schools with their mathematics instruction. Here is an overview of my professional skills. I live on a small island off the coast of British Columbia, Canada where I grew up. It is beautiful and we are settled. If it is absolutely necessary, I will live apart from my family for at least part of the year, but ideal work for me would allow me and my family to remain where we are. I don’t mind traveling if it is necessary for work. I’m looking for work that makes use of my skills and allows me to grow and continue to be challenged to learn new things. Sharing my resume with people and organizations that you think may be interested in someone with my skills. As some of you probably know, I’m one of the lead designers on an open source math curriculum. Today I had an interaction that reminded me of a key benefit of open source curriculum. In a traditional curriculum model distributed either on paper or via PDF, Hannah would have to either print and then painstakingly correct the errors above by pasting over them or use some likely-painful-to-use PDF editing software to fix these errors. We distribute our open source curriculum via Google Docs and as a result Hannah can just make a copy of the document, make the edits she wants, and then print the resources for her students. Hannah is also legally able to do this because our curriculum is licensed specifically for adaptations. 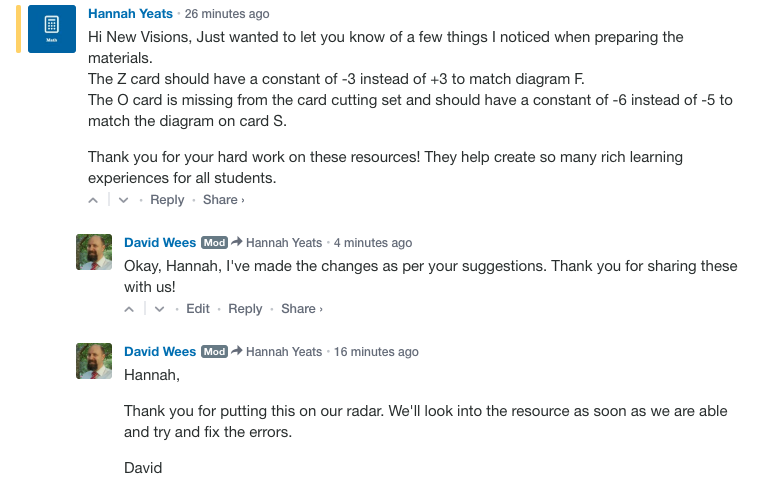 Since each resource we create has its own page on our website (the resource Hannah describes is here), Hannah was able to comment on a specific document and I was able to respond to her transparently. There are drawbacks of using Google Docs. 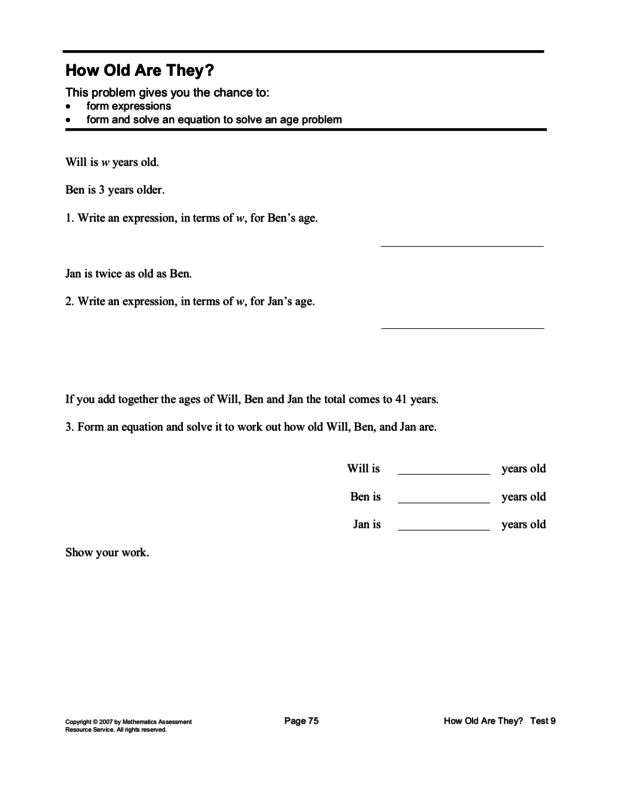 For example, it is not currently possible with our curriculum to print out the entire set of student handouts. This is a fairly frequent request we get from teachers but we don’t know yet if the loss of editability is worth the increased ease of printing resources. It would be helpful for me to know what other pain-points exist for teachers when adapting and modifying curriculum for their own classroom use, especially given that a high percentage of teachers make adaptations to curriculum they are given. If you were in charge of how someone shared curriculum, what would make it as easy as possible for you to make thoughtful changes to that curriculum? I have been to perhaps a dozen national conferences and to two dozen or so regional conferences across the United States and Canada. With the exception of one or two of these conferences, I regret having ever attended. My regret stems not from finding the conferences uninteresting or not enjoying meeting people face to face that I had only ever met previously online, my regret stems from the fact that I think these conferences are fundamentally immoral when our world is in crisis. Conferences that draw people from all over a country or all over the world require participants to fly to a single destination. This results in thousands of people flying to destinations whom otherwise would not be flying. 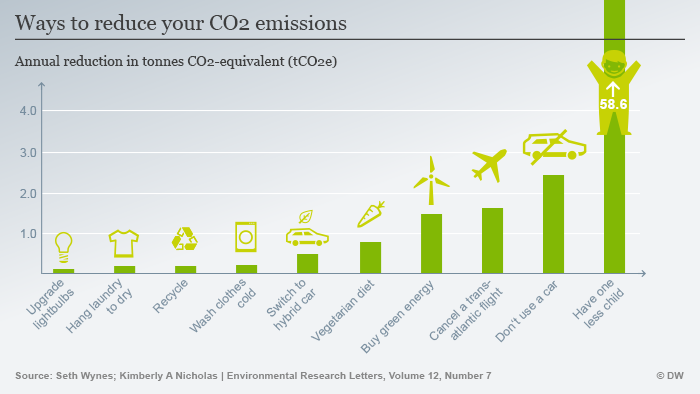 Unfortunately, flying in an airplane carries with it a huge carbon footprint. 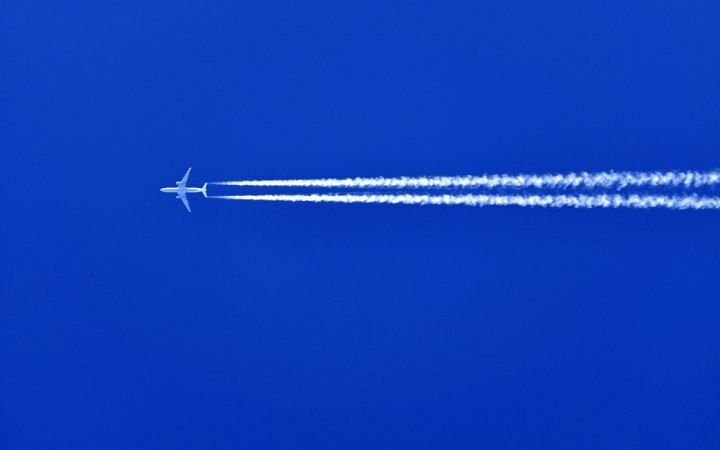 One flight across a continent or across the Atlantic has roughly the same carbon footprint as using a car for an entire year. Here is an aggregated list of conferences across the United States. I counted 1374 conferences occurring next year, each of which may have many hundreds to thousands of participants. That’s potentially millions of flights each year for people to attend these conferences. Maybe these conferences would be worth their carbon footprint if people learned something significant from them that changed their practice. But my experience is that this is not true. In most cases, I suspect that if a few people took two days off from work and read the same good book about teaching and then planned together based on that book, they’d get as much (or more!) out of those two days than they learn from attending 10 different scatter-shot presentations. Sessions are just not typically long enough to result in tangible learning and presenters often just don’t know the actual audience of teachers they end up with well enough to plan a session that meets those teachers’ varied needs. It’s true that once in a while I’ve attended sessions that really made me think. A few years ago, I attended the NCSM and NCTM conferences back to back, focusing only on sessions on instructional routines, only attending sessions by a group of people who worked closely with Magdalene Lampert on these routines. That was a hugely valuable conference for me! But 1 hugely valuable conference out of the 18 or so I have attended does not justify the environmental cost of these conferences. Virtual conferences: Sessions are run via web conferencing software. These are ideal replacements for non-interactive (or minimally interactive) presentations that dominate most conferences. Book study groups: Grab 2+ friends and take two days off from work. Everyone reads the same book on day 1, on day 2, everyone convenes to first describe what things they learned and then make plans to implement some of the suggestions. Run smaller regional conferences: I know everyone wants to see Fawn Nguyen, Jo Boaler, or Dan Meyer speak at conferences, but I believe there is lots of local expertise in most parts of the world that could be drawn upon instead. This year I cancelled my presentations at the NCTM annual conference, the NCTM regional conference in Seattle, and CMC South in Palm Springs. I went to one conference that I could drive to up at Whistler, the Northwest Math conference (it was really good). I do not intend to submit proposals to conferences in the future that require me to fly to the conference. Geometric constructions are amongst my favourite things to teach in Geometry. Why? I see each geometric construction as a puzzle to be solved and I love watching children solve puzzles and share their solutions to those puzzles. 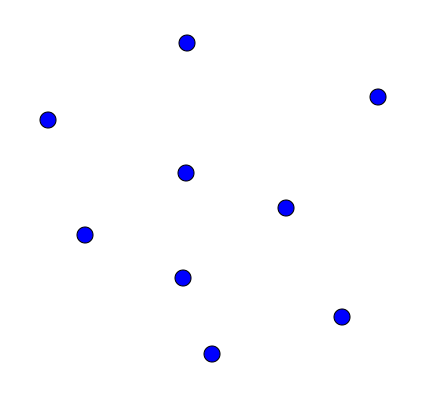 Puzzle #1: Given a line segment, draw a circle with its radius as the line segment. Many constructions build on earlier constructions so that as students figure out how to do earlier constructions, they build the pieces they need to figure out more complex constructions. Further, more complex constructions embed all sorts of opportunities for practicing earlier constructions. 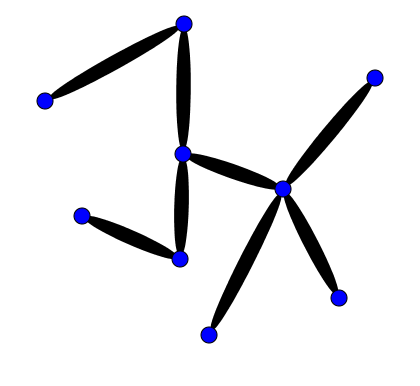 Puzzle #2: Draw another line segment with the same length as the given line segment with an endpoint on either A or B. The invention of dynamic geometry software, like Geogebra, means that students can learn these earlier constructions without their early challenges using a compass and straightedge interfering with their ability to learn the mathematical ideas behind the constructions. Puzzle #5: Draw a line segment that is exactly three times the length of the given line segment. 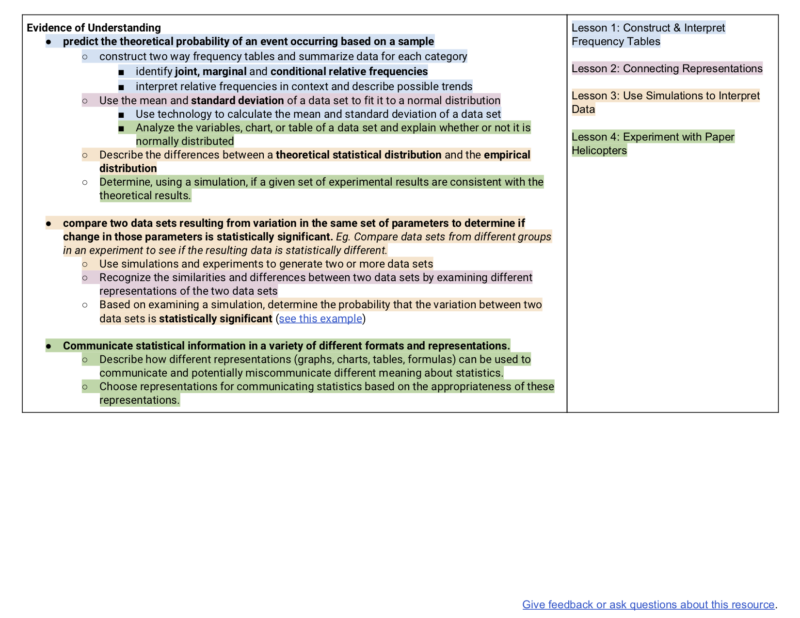 It is super helpful for students to have their prior work with constructions visible for themselves as examples to work from, and so once students have figured out how to do a construction with the digital tool, I have them transfer their construction to paper (ideally in their notebooks for reference) so they can access it later. Puzzle #10: Draw three overlapping circles on the same line such that two of the circles have their centers on the middle circle. Another advantage of the digital geometry tools is that you can provide partial constructions for students. This way students can work on the part of the construction that is new. This doesn’t give students practice with the earlier part of the construction but it is a subtle way to give hints to students for particularly complex constructions. Puzzle #11: Use the circle below to help you draw a regular six-sided shape (regular hexagon). When a student shares their constructions with the class, I usually call up a volunteer that is not that student to come up to the front of the room and perform the construction, following the verbal instructions from the first student. This means that the pace of the construction is likely to better match the pace other students can follow or copy the construction which leads to more students understanding the construction. After the construction is complete, I can ask another student to restate the instructions while I annotate important features of the construction. Puzzle #17: Construct an octagon (regular 8 sided shape). The last few constructions, I provide the least amount of support for students since a goal of mine is to see if students can do these constructions independently. However, note that in the instructions for the constructions, I try to make sure that the language of the constructions isn’t a barrier for my students. Constructions #1 through #17 are available in this Geogebra book and a paper copy of these instructions is available as Lesson 2 of this Core Resource. Let me know if you have any questions and please share other ideas you have about introducing students to constructions. Great teaching is more than putting good tasks in front of students because a good task enacted with terrible pedagogy is still terrible teaching. While I think hardly any teachers are terrible, every teacher can be better than they are. I see a lot of sharing of tasks, games, and activities via Twitter and blogs, but I see much less sharing of pedagogical strategies teachers would use with those tasks, games, and activities, which means a lot of people are losing potential opportunities to learn about pedagogy. Often people share routines like Which One Doesn’t Belong or Connecting Representations which on the surface look like pedagogical strategies, but while the names themselves are somewhat descriptive, they aren’t sufficient to understand the routines they describe. That’s part of the reason we created videos of the two main instructional routines embedded in our curriculum, Contemplate then Calculate and Connecting Representations. Here is a (compressed) video of Kit Golan enacting Connecting Representations with his 6th grade students. We also created slides, a pre-planner, a lesson plan, and a description of the routine to go along with these videos. A new project we are working on is to share the instructional components that make up the routines. Here is a video showing different talk moves that can be used by teachers, either within the routines or whenever they are needed. Here is another video showing Kit that focuses on the annotation he did while another student restated the strategy of another student, showing that these different instructional strategies can be used together and towards specific instructional goals. It is important that explanations in the math classroom are clear and complete so that all students can follow the mathematical arguments presented. Here is one of our teachers describing how she supported students in creating clear mathematical arguments for each other to follow. Are videos like these helpful? Would more videos sharing some of these strategies be helpful (if so, which)? And can we share more math pedagogy with each other? There are two common activities teachers do that have either little to no impact on student learning but which do take teachers a tremendous amount of time, time that could be better spent on other activities. When teachers pair grades with comments, common sense would tell us that this is a richer form of feedback. But our work in schools has shown us that most students focus entirely on the grade and fail to read or process teacher comments. Anyone who has been a teacher knows how many hours of work it takes to provide meaningful comments. That most students virtually ignore that painstaking correction, advice, and praise is one of public education’s best-kept secrets. But grading student work is extremely time-consuming and so if this effort doesn’t lead to student learning, why do we do it? We are expected to grade student work. In a recent parent-student-teacher interview, the teacher had samples of my son’s work in front of him. He shared directly what he liked about his work and where he thought my son could improve and we never talked about the numbers at the top of the paper at all. It is easier to communicate progress using artifacts of student learning. 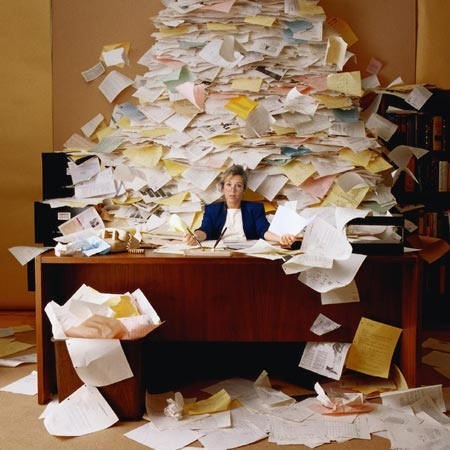 Schools, in the interest of focusing on activities which have clear connections to student learning, should stop grading students and focus on time-efficient ways to solve the problems grading is intended to solve. Should teachers still look at student work? Definitely, but this should be as part of their process of planning future lessons and thinking about opportunities for feedback for students. I spent years writing tasks for each of my classes, borrowing from other teachers when I could, but mostly making my own resources from scratch. These resources were not of much higher quality than what I could get from a textbook but I understood how they were designed and how I intended to use the resources. Writing curriculum took me SO much time. Now I write curriculum about 50% of the time for my day-job and can see that the curriculum I currently create is far superior to the curriculum I used to create and far more complete and coherent. But it probably suffers to some degree from the same problem that led me to create my own curriculum as a teacher — it is extremely difficult to make sense of someone else’s lesson or task. One feature of the curriculum I write that I think helps mitigate this problem of understanding curriculum is that it contains instructional routines. Once one knows a particular instructional routine, the task of understanding tasks to go along with that routine is far easier. Teachers who know the Connecting Representations instructional routine can look at tasks and are better able to make decisions about which tasks to use and why. Evidence on use of curriculum suggests that all teachers benefit from access to high quality curriculum resources. In this experimental study some teachers were given access to Mathalicious and others were not, and the teachers who had access saw better performance from their students. What I think teachers should have more time to do is modifying and adapting curriculum for their particular context and their particular students. This is why our curriculum is licensed with an open license and why we share the curriculum in Google Document format — it makes it much easier for teachers to adapt and modify the curriculum rather than having to recreate a document from scratch just because the original is locked in PDF format. We also wrote our curriculum to be largely sequenced but with lots of opportunities for teachers to make choices within the curriculum or to design their own tasks. 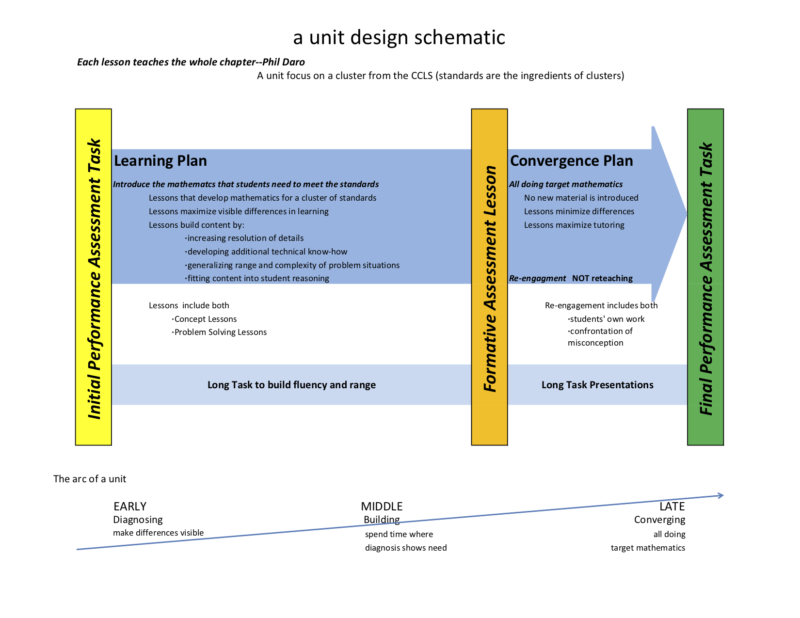 Our tasks are aligned to the evidence of understanding we expect to see in students, which means the blueprints for constructing their own tasks are available to teachers as a support – leading to the best of both worlds for teachers: the autonomy to construct their own curriculum while not needing to reinvent the wheel each day. Work with individual or groups of students to support their learning. What else could teachers do with their time to support student learning if all of a sudden they had more time available? A number of times over the past few years, I have been confronted by a phenomena I do not understand: children being handed workbooks and, with very little to no instruction, expected to complete the workbooks and develop an understanding of the material contained within. For some children this works out fine. The workbooks, mostly being designed for independence anyway, are sufficient for children who have some background in the material and see the patterns developed within the workbooks. For many children however, the experience is potentially one of frustration and humiliation: they have been given a task that their teacher clearly expects them to be able to do, and they cannot. I have seen workbooks handed out with minimal to no instruction in two very different kinds of circumstances. In one case, the teacher sees a class with a diverse needs and although all of the students had the same overall goals for the class, students clearly have different levels of preparation and interest in the course. The other case is when teachers have a multi-age classroom (which also contains students with different levels of preparation and interest) and no time to actually teach anything at all. Both of these are compounded by the preparation of the teacher leading the classroom to deal with varied needs. I have been in the first case, leading a group of students with varied needs but with the same goal, many times during my career. The best solution I have learned is the use of instructional routines with designs for interaction to support a varied set of needs, while working together towards the same mathematical goal. As for the second case, when teachers have a multi-age classroom, I don’t know for sure what I would do. If I found myself teaching in such a classroom, I think I would do two things; teach mini-lessons (using a variety of formats depending on the mathematical goals, but again instructional routines seem like a good fit) and assign problems from a somewhat independent workbook, and then while some students are working in the workbook, engage the other students in a mini-lesson on a different topic. I would have to organize the space so that students who were working on similar material sat together and I would need to develop classroom culture so that students knew to talk to each other after first trying the math themselves and to wait until I was available to assist. I would also look for places in the mathematical goals for the year where potential alignment between different grade levels occurs and use these opportunities to engage the entire classroom. For some students the activity might be review and for other students the activity might be somewhat new material, but both of these seem like helpful ways to use classroom time. Imagine you are teaching a classroom with 20 students roughly evenly distributed from grade 2 through 7 (age 7 through 13). What would you do to meet the needs of these learners? Essentially, conceptual understanding is knowing more than isolated facts, it is also knowing connections between those facts and having those facts well organized. This image represents someone who understands some isolated facts. I propose that those line segments between the points, representing the connections between isolated knowledge, are themselves a type of knowledge, consequently our second image is really more like the first image. What is clearly missing in this analogy is that conceptual understanding is knowledge that is well-organized, but I claim that organization of knowledge is itself another type of knowledge. Also missing is knowing why the knowledge is important and the contexts in which an idea are useful, but again these also seem just like other types of knowledge. Let’s take a look at a problem I had to solve recently and see if we can use it to unpack what conceptual understanding is. According to the solution key, the writers of this question are assessing students’ ability to solve quadratic equations. However, that likely requires applying the quadratic equation to all four equations given, which would be time-consuming and potentially error-prone. When I solved this problem, I saw four quadratic functions, each transformed from y = x2, and based on those transformations, I was able to eliminate (1) and (3) as options since they have real solutions. I also know that if 1 – i is a solution, then so is 1 + i, and that the sum of the roots of a quadratic function are related to the coefficient of x in the equation. I could not remember if the sum of the roots is equal to the coefficient of x or to -1 times the coefficient of x, so I multiplied out (x – a)(x – b) to double-check and determined that if a and b are the roots of a quadratic equation, then -(a + b) is the coefficient of x in that equation (assuming a lead coefficient in the equation of 1). 1 – i + 1 + i = 2 so (4) must be the answer. My actual solution strategy doesn’t matter all that much, what matters is that in order to produce it, I needed to know some smaller things and that those smaller things could be seen as connected together to create a larger idea. Instead of seeing this as the difference between an expert and a novice, I prefer to think of knowing things as being a gradient between knowing a little bit and knowing more than a little bit. Conceptual understanding is both knowing ideas in an interconnected and organized way and knowing more ideas along the novice-expert spectrum. The reason why conceptual understanding is an important goal is because otherwise we might be tempted to rely on teaching kids tricks instead of mathematics. What mathematics does a child learn from learning this procedure for adding fractions? Very little! 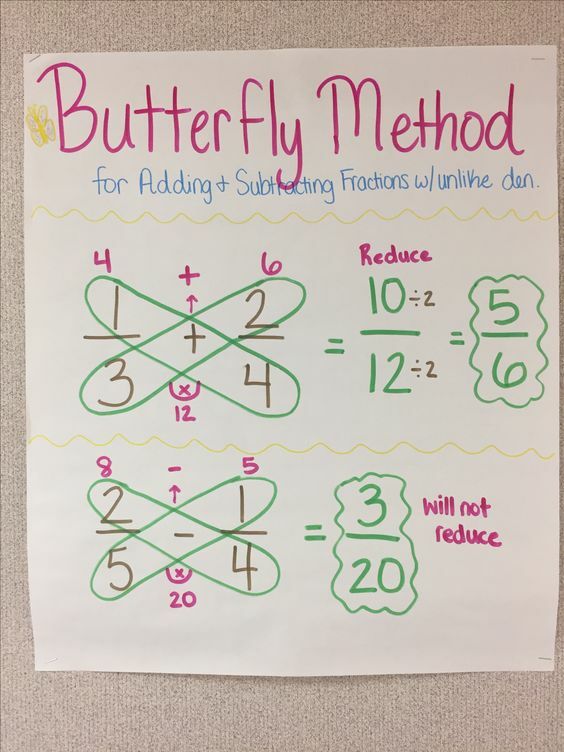 It is extremely difficult for a child to connect this procedure to other mathematics that they know, consequently using a trick like the butterfly method is likely to lead to students knowing an isolated idea and not much else. Note that I am not opposed to memory aids, I just think they should be based on solid mathematical reasoning and they definitely should not be taught instead of the mathematics.